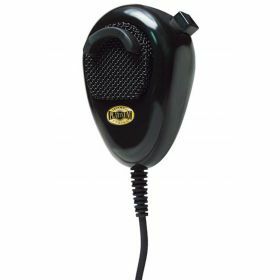 This deluxe noise cancelling professional microphone with a black mesh screen is perfect for use in noisy enviornments. Delivers clear voice transmissions by filtering out background noise from wind, music, rattles, road noise and other un-wanted sounds. Coiled 9' cord provides adequate length for most applications. Great for use with CB and Amateur radio applications. Wired with a 4 pin standard (Cobra/Uniden) screw on microphone connector. Clamshell package.